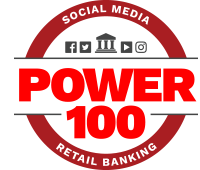 The top banks using social media ranked by their overall Power 100 score for the first quarter of 2016. If you think your financial institution should be listed here and it isn’t, please click here. Note: All data pulled on March 29, 2016. This article was originally published on April 4, 2016 . All content © 2019 by The Financial Brand and may not be reproduced by any means without permission.